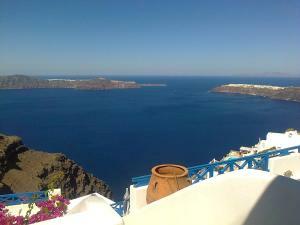 The Annio Flats is a typical Cycladic settlement located in Imerovigli, at the highest point of the Caldera. 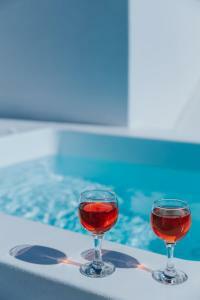 It offers apartments with balconies and stunning views of the Aegean Sea, Skaros Castle and Santorini Volcano. Please inform Annio Flats in advance of your expected arrival time. For this, you can use the special requests section when making the reservation or contact the accommodation directly. The contact details appear on the booking confirmation. Extra beds are available upon request and their availability must be confirmed by the establishment. This traditional built and style apartment consists of 1 bedroom, living area, kitchen and private porch. This traditionally built and styled apartment consists of 1 bedroom, living area, kitchen and a private porch that overlooks the town of Oía and the volcano. This apartment opens onto a balcony and features seating and dining areas and tiled or marble floors. This studio has a balcony with caldera views, a patio and tiled / marble floors. Apartment with private entrance, sofa and patio.